Research on language and communication development and intervention in persons with mental retardation has been conducted at a fast and furious pace during the last two decades. Past attempts to summarize this research have been rather restricted, focusing on a single, narrowly defined substantive domain such as lexical development, or of a single etiology such as Down Syndrome. This volume, in contrast, presents a critical, integrative review of research and theory on language development and processing across all domains and a variety of etiologies. In addition, many previous attempts to review portions of this research have failed to consider the research within the context of current theory and data from developmental psycholinguistics and linguistics. 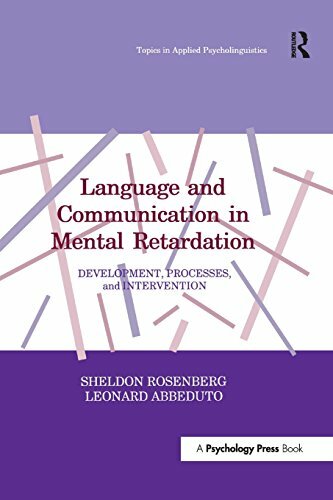 A major contribution of this book is the emphasis on relevant work outside of mental retardation for understanding and treating the language and communication problems of persons with mental retardation. Finally, this book is comprehensive and up-to-date across all the areas of language covered including appropriate introductory material in linguistics and psychology -- discussions of the innateness, cognition-first and motherese views of normal language acquisition. In addition, the authors' extensive bibliography is valuable in and of itself to any serious student or professional in the area.